The demolition of Penn Station in 1963 destroyed not just a soaring neoclassical edifice but also a building that commemorated one of the last century's great engineering feats-the construction of railroad tunnels into New York City. 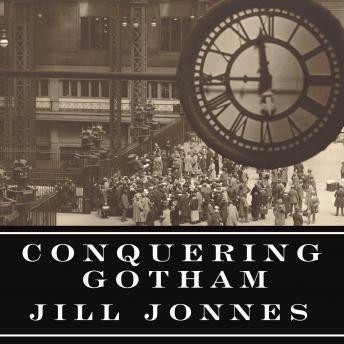 Now, in this gripping narrative, Jill Jonnes tells this fascinating story-a high-stakes drama that pitted the money and will of the nation's mightiest railroad against the corruption of Tammany Hall, the unruly forces of nature, and the machinations of labor agitators. In 1901, the president of the Pennsylvania Railroad, Alexander Cassatt, determined that it was technically feasible to build a system of tunnels connecting Manhattan to New Jersey and Long Island. Confronted by payoff-hungry politicians, brutal underground working conditions, and disastrous blowouts and explosions, it would take him nearly a decade to make Penn Station and its tunnels a reality. Set against the bustling backdrop of Gilded Age New York, Conquering Gotham will enthrall fans of David McCullough's The Great Bridge and Ron Chernow's Titan.